Two steam trains and passenger cars at Shinbashi (also Shimbashi) Station in Tokyo, ca. 1873-74. This is an extremely rare view because it is photographed shortly after the opening and because almost all photos of this station show the front. The locomotives in this photo are from the first ten imported to Japan. The one in front is a Sharp Stewart locomotive, while the one across the platform is one of two Avonside locomotives that were imported among the original ten. By 1909 (Meiji 42), the Avonside locomotives had been moved to Taiwan. Designed by American architect Richard P. Bridgens (1819-1891), Shinbashi was the original terminus of Japan’s first railway, the Tokaido Main Line, connecting Yokohama with Tokyo. It was opened on October 10, 1872 (Meiji 5) and named Shinbashi Teishajo (新橋停車場). 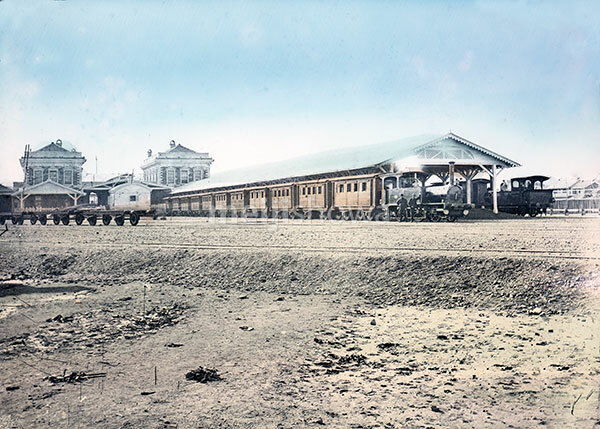 In 1914 (Taisho 3), the station was demolished to make way for a goods yard named Shiodome Station (汐留駅). Shiodome Station closed in 1986 (Showa 61) and in 2003 (Heisei 15) a reconstruction of the original Shimbashi Station was completed.